WIE IS LUKAAS VAN HOUT? 2. Versameling van die ander Israelvolke hier by ons. 3. Party van ons wat geestelike leiding sal gee aan hulle. 4. 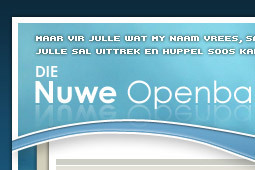 Die vernietiging van die bose swart volke om ons. 5. Die vernietiging van die VSA as die groot Babilon. 6. Die oprigting van die Boere-republieke, met die Vierkleur in Pretoria. Elkeen van hierdie punte sal ek vir julle kan bewys vanuit die Skrif, inteendeel as die Dogter van Sion-gemeente doen ons dit al vir die afgelope 20 jaar. Ek vra nou aan hierdie verbitterde volksgenote van my, julle wat dink dat julle en julle profete/tesse die franchise van verlossing besit, wat bied julle die Volk? Kom, gee dit vir ons. Ons Vader het juis in Sy almag besluit om `n buitelander op te wek, uit dieselfde bloedlyn as ons, naamlik Hollands, Duits Iers en Nordies, maar `n burger van Babilon, Amerika, want met al die faksiegevegte tussen Israel-gelowiges in hierdie volk, sou Hy nooit almal kon bevredig het as hy een persoon uit die Volk sou gebruik het nie. Kan ons nie net nederig en stil raak voor die Almagtige nie, dan kan ons dalk Sy Stem van liefde herken. Onthou, die Stem van Sy liefde is `n oneindige liefde innerlik na die volk toe, maar `n oneindige verskrikking vir die liefdelose heidense nasies daarbuite, want hulle haat die lig wat met Sy en Sy volk se liefde vrygestel word. Pas dus op dat jou liefdeloosheid jou nie gaan plaas by die heidense nasies nie, waar jy in elk geval vernietig gaan word. Ek plaas inligting oor Lukaas soos wat ek dit ontvang het, aangesien verskeie mense my oor hom uitgevra het. `n Mens hoef in elk geval nie te weet of dit cumulus- of stratuswolke is wat die reën gebring het nie, reën is reën, ongeag die tipe wolk. I am from the USA. I became involved in the Boer/Afrikaner genocide after having met a person from South Africa who took the time to teach me much of the history of South Africa and the Genocide now happening. Up to that time, I too believed the malicious propaganda against the Boer and Afrikaners that had been presented to the world these many years. This re-education of myself occurred over about a 3 week period. We spent many hours online talking on Skype and towards the end, as I began to see the truth for myself, I had never in my life felt so betrayed by the media`s out and out lies and perpetuating all the propaganda that we were fed and in all the forms that it was fed to us outside of South Africa. Accepting these truths was not easy, I had to do a complete turnaround of many of the beliefs and misconceptions that I held and believed in many areas of my life. The rest is history and the journey began. I need to be honest though, about two weeks ago I was ready to walk away from all that I had committed too. A very bad experience and I was on the road ready to walk back to Johannesburg if need be." No need to go into details, but I hated everyone and confessed this to Yahweh. I told him I really hated these people and was through. As I walked along, knowing I might freeze to death and not caring either way, down the road came a sister of the faith in her auto. I looked in her face as she pulled up alongside me and knew there was no point in arguing. One simply does not argue with a determined Boer woman. We talked for awhile as we drove and found a resolution and I recommitted to our cause and that was the turning point. Yahweh had a different plan than what I thought and during the next few days, that was when my life went in a new direction. As I said in an earlier post, I began to meet many people and farmers and have been invited here and there to share the word and celebrate the brother and sisterhood of our people. So much to write on that subject but another time, suffice it to say, it continues to reveal more and more each day. Now you know the whole story and why I wrote about being so richly blessed. So much has been opened and shown to me through all these people, a stranger in a strange land and treated as though I was a visiting dignitary. As for that bad experience, it has only shown me how terribly many of our people are suffering and what they resort to for survival. I am not angry or bitter towards those that so wronged me now. I understand and easily forgive them. How can I do otherwise? They are my brothers and sisters and I love them. This experience is also a blessing in helping me to understand the whole picture. So yes, I am blessed through all of these experiences and in the fullness of time, remember, Yahweh has a plan through all of this and I have grown and am so much more then I was in understanding trust and obedience to Yahweh in what he has planned. In this, I place my full trust and faith. The time will come when I can say more. Last night I went out to the open fields, gazed upwards at the brilliance of the starlit night sky prayed and thanked Yahweh for all these things and also asked a question in prayer. When I opened my eyes my gaze was fixed upon the constellation of the Southern Cross. I smiled, all is well brothers and sisters, fear not. Yahweh has a plan. Your humbled brother in Yahweh. O en Baie dankie my liewe, liewe, Boer Suster! Know that it is with great trepidation that the words that are posted from time to time in the name of Yahweh from me is. Some of which is stated is at complete odds with what I was raised to believe in the United States pertaining to faith and beliefs and I am only one among millions upon millions of people throughout the world who did not know these truths as they relate to South Africa in prophecy. In less then a year these truths have changed the beliefs I once held and as the words first began to come, they caused me great distress. This was discussed with a Boer brother and was counseled by him to write and post as directed from above. I know only that a powerful presence is felt, one of great power, love, and always very gentle whatever the message might be. I then pray and write as led to do so. I am no saint and openly confess and admit to being a hopelessly lost sinner saved by the grace of Yahweh through his son, Yeshuah. For the past many months the following has been my personal thoughts. May Yahweh give me peace as the words are written and delivered to his people. And if these words are false and not of the Father, then let my life end that I never falsely represent Yahweh to his people. Dankie Vader vir alles wat jy my gegee het om te doen vir jou mense.